Holly Tree Cottage provides an imposing welcome to Riverbank Holiday Cottages, with its wrap around decking and imposing backdrop of the highest peak in Argyll. The cottage comfortably sleeps up to six guests in three well proportioned bedrooms, each of which has its own en suite facilities. Very convenient and comfortable cottage. Well equipped kitchen and comfortable beds with good quality bedding. Toiletries in bathroom a nice touch. WiFi was very intermittent and often did not work at all. Overall cleaning was fine but there was a bit of a mess in the freezer, the interior of the cupboards needed attention and the cutlery and crockery had been put away without being checked - some was not as clean as you would like. Great cottage with scope for some improvement. Overall, the cottage is excellent. It's beautifully decorated and super comfortable. From a catering perspective (I was cooking for four clients all week) the kitchen bin needs to be much bigger, some replacement bin liners would have been good, a recycling receptacle in the kitchen would be really helpful and the dishwasher was leaving bits of dried food stuck to everything, so all washing up had to be done by hand. The drying facility in the utility room is very effective but needs to be bigger for 5 to 6 people. So, thank you to The Clachaig for such a beautiful and comfortable place, we would stay again and perhaps you could make the kitchen more user friendly? Modern, well equipped, spacious cottage. Great location with fab views. The road leading from the main road is a single track and a wee bit bumpy but well worth the drive! This is my second time staying at Hollytree and I look forward to my third! This was our family holiday with friends and our first stay in Scotland. The location of this cottage was superb for the areas we wanted to explore during our holiday. We were excited for our holiday especially after reading the reviews. On arrival the reception staff didn’t seem that helpful, even though we’d phoned during our journey and explained the journey has been over 10 hours long and were hoping to gain access to the property. I’d also spoken with the staff upon booking and one week prior to our holiday. Finally received keys after patiently waiting whilst enjoying a pint, however had to chase reception rather than reception informing us. The road to the cottage is awful, some large potholes and space only for one car. Ample parking. First impressions of cottage upon entering, the porch is out dated, good space for shoes etc. Hallway lovely with nice furniture. Living area acceptable. Bedrooms all with ensuite great as sharing with friends, which is one of the main reasons we choose this cottage. Most of the time someone had to sit on dining chair as seating not ample enough for 6 people. Outdoor furniture also didn’t accommodate 6 people. Bins and recycling full up on day of arrival therefore I had to use a large bin liner to accommodate our recycling for the week. They boys sorted the bins. All the bed linen from previous tenants left in green house in full view on day of arrival. The cooking pots and pans weren’t great either and need upgrading as we cooked 5 nights out of 7. The windows in the cottage grimy and condensation on each day. As the week progressed we noticed mouse droppings in the kitchen and bedrooms. WiFi was lost for at least one day. The wardrobes smelt and all our clothes needed washing once home. On the whole we enjoyed our visit to Scotland and look forward to returning again in the future but found the accommodation very disappointing and most certainly wouldn’t stay or recommend to anybody as this wasn’t a reasonable price to pay for this standard. A great break in Glencoe. We had a week's walking holiday in October staying at the Holly Tree Cottage in Glencoe. Having previously stayed in various accomodations around the area, we enjoyed our stay there very much The cottage was very clean and well equipped, and was so quiet and peaceful which was a big benefit. The free wifi was of a very good speed and strength, the only minor faults we thought were the small tv hanging from the wall with all the cables to sat box and dvd in plain sight. A larger tv in a corner unit would make for a better looking area, and also the recent introduction of £10 per night charge for a dog seems steep. But overall, very glad to recommend the cottage, we enjoyed our stay so much that we have booked it again next April! A very nice cottage with everything you need. This is our seventh stay. In general the house was clean, but the kitchen and kitchenware were dirty. Location and views are great. Hello and thank you for review. That is disappointing to hear about the kitchen, we will pass your comments on the people who clean the properties for us. We hope you enjoyed your holiday and we hope to see you back again. Stayed for a week at Holly Tree with my daughter, son in law, 2 Grandsons & my friend.The 3 bedrooms all on suite were very comfortable and spacious. The cottage is in a beautiful area and Glencoe is stunning. We had deer walking past the cottage much to my Grandsons amazment being townies. For a holday on Scotlands west coast its ideal being short drive to Ft William and slightly longer to Oban. The train to Mallaig from Ft William is a must. I will definately be back, thanks Clachaig Holidays. Excellent location,fantastic cottage only complaint was no hot water for toilet sinks and privacy at the patio area. Thank you for your review. We will need to have a look at the hot water issue. Thank you for bringing it to our attention. My holiday was that good I immediately booked a second week. HollyTree is a great place to stay with all the comforts from home and everything you need locally. The local people of Glencoe always give a warm welcome to all and make you feel right at home from your first day. I would highly recommend Clachaig holidays at Glencoe to everyone. I’m heading back again October. Had the pleasure of staying at the Clachaig Inn for a week. The service, accommodation and food were all first class. I would definitely recommend the Clachaig, and am looking forward to my next visit. Thanks for the lovely feedback. Sounds like the cutlery drawer needs checking. Will get straight onto it. See you again soon. 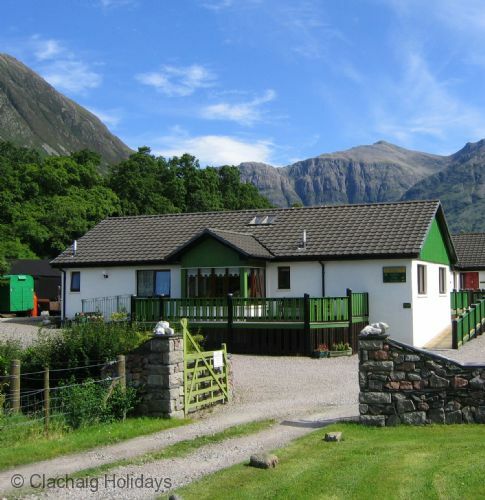 I would recommend clachaig holidays to anyone wishing to have a holiday at Glencoe and the surrounding area. The staff are very friendly and helpful. The accommodation is clean and comfortable and you can order some of your groceries for your arrival which is really handy. The co op is just down the road as is Crafts and things and great places to eat. There is also really stunning walks right on the door step and everyone is friendly. I’m looking forward to my next stay.